Do you remember, as a kid, sleeping in your clothes all night because you were so excited to start that family road trip to Florida early the next morning? It didn’t matter that you had to get up at 4am. You were ready to spring out of bed at 3:56am! I had a similar feeling when I woke up on Friday morning. I didn’t need to be up for another hour, but I was laying there with my eyes wide open, impatiently contemplating my first glimpse of the beast…the mighty Poas Volcano! After all, it’s not every day that one gets to peer directly into the mouth of the world’s largest active volcano. After a quick breakfast, we jumped into the Peugeot 206 and backed onto the road. Our adventure began immediately when I stalled the tiny death trap on a steep section of road and almost rolled backwards straight into one of the infamous drainage ditches! After narrowly escaping the clutches of the concrete chasm, we screeched off and headed up the hill. 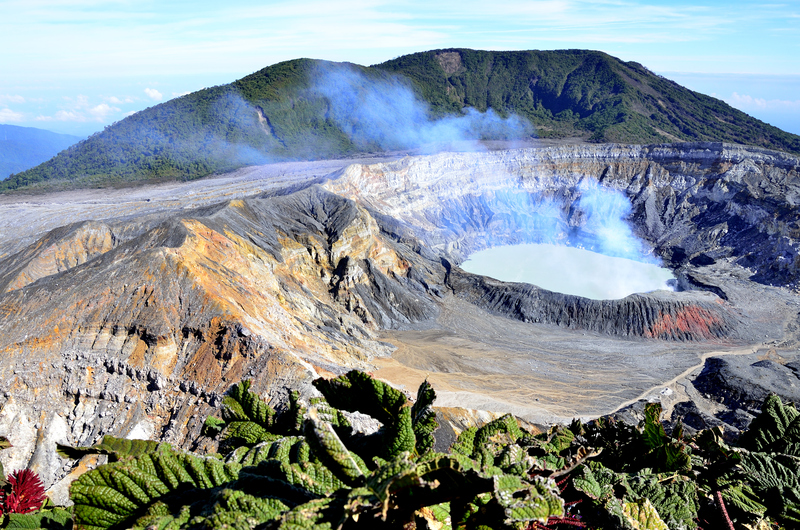 It’s only a short 5-10 minute drive from the Poas Lodge to Poas Volcano National Park. We wound back and forth up the road with mountain walls on one side and pastoral settings on the other. I recommend getting to the park as early as possible for a couple of reasons. First, you beat the traffic. 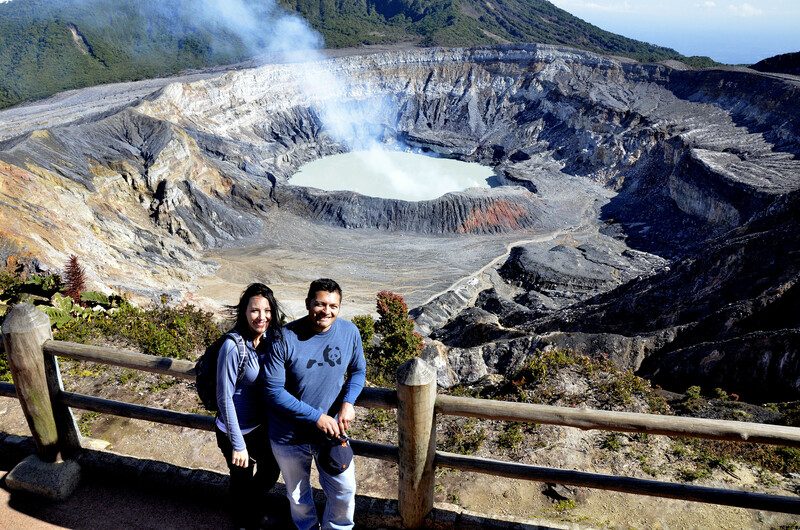 Poas Volcano National Park is only an hour and a half drive from San Jose, making it hotspot for both ticos and tourists. The droves start arriving in busloads at about 8am. Second, the volcanoes in Costa Rica can be extremely shy, concealing themselves in cloud cover for most of the day. So your best chance to steal a glance of the restless giant is before 10am. We entered the park around a little after 7am and were happy to see that we had beaten the masses. After paying an entrance fee of $10/person, we were directed to back our cars into the parking spaces in case of an emergency evacuation. They sure do know how to build anticipation! It’s was an easy 10-minute walk from the parking area to the lookout platform via a paved trail that doubles as a maintenance road. The trail is flanked by thick vegetation, including lichens, ferns, bromeliads, and the extremely cool sombrilla de pobre (poor man’s umbrella) plant. Take a gander at the picture to the right and you’ll know how this Jurassic-era looking plant got it’s moniker. If it had rained that morning, we could have easily found shelter beneath its giant leaves. Fortunately for us, it was a clear morning with a moderate temperature somewhere between 60-65°F. On cloudy, windy days, I’ve read that the temperatures can drop to just above freezing! The trail abruptly comes to an end at the observation deck overlooking the monstrous bowl-shaped depression below…the Beast. Poas gives new meaning to the term “colossus.” Its’ summit towers over the central valley at 8,800 ft (2,700 m) above sea level. 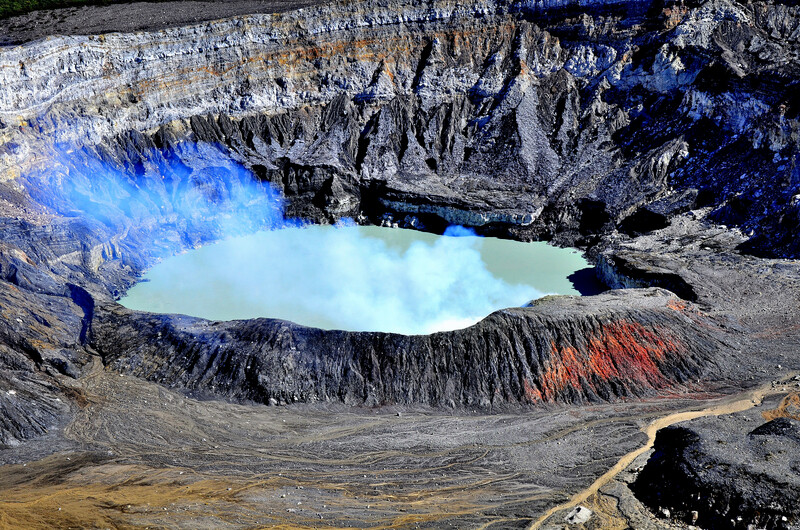 Its’ caldera plunges 1,000 ft (305 m) below the rim and stretches almost a mile across (1.5 km) to the other side! 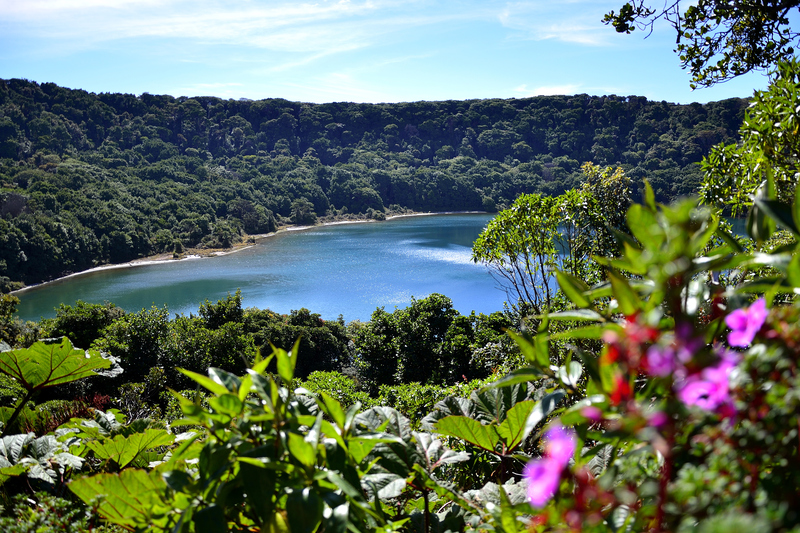 The lifeless moon-like landscape of the crater starkly contrasts with the dense cloud forest and stunted forest that provides refuge for almost 80 species of birds, countless insects, and a handful of small mammals. Staring into the mouth of the beast is both awe-inspiring and a little unsettling at the same time. The grayish-green sulphuric lake shoot geysers hundreds of feet into the air. Over the past decade, the water level of the lake has decreased by almost 50 ft, leading experts to believe that an impending eruption is just around the corner. Although semi-active, the volcano hasn’t erupted since the mid-50’s. I think it’s only a matter of time. After taking photos of the barren wasteland and the gurgling cauldron, we decided to hike up to a second crater in the national park. The trails were paved and very easy to navigate. 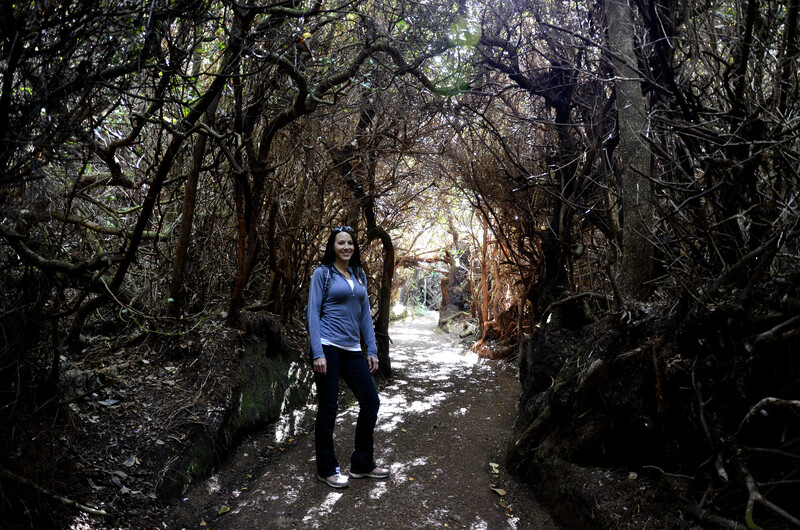 Parts of the forest we walked through reminded me of the creepy forest in the Wizard of Oz. I was seriously winded after climbing another 200 ft to the next observation deck. The payoff was worth the effort! 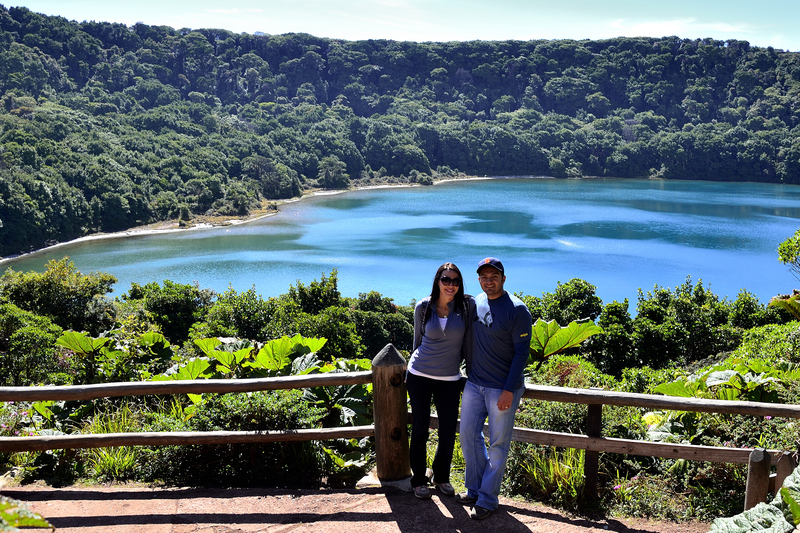 The extinct crater below the viewing platform contains a crystal clear fresh water lake called Laguna Botos. It is encompassed by dense forest and is arrestingly beautiful…a literal paradise. I wished that we could have made our way down to the lake, but I didn’t notice any trails that allowed us to venture any further. 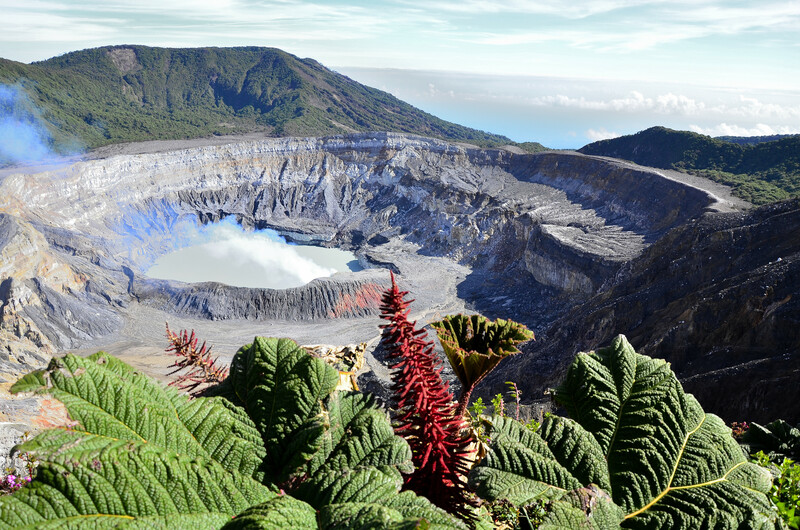 Poas Volcano National Park is one of the top attractions in Costa Rica. 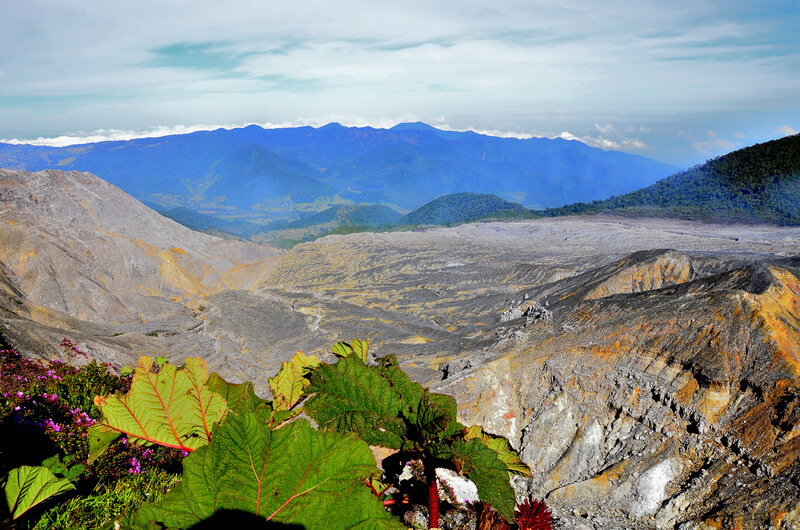 Its’ beastly crater strikingly contrasts with the picture-perfect beauty that surrounds it. Yes, Poas comes with a lot of hype…believe it! 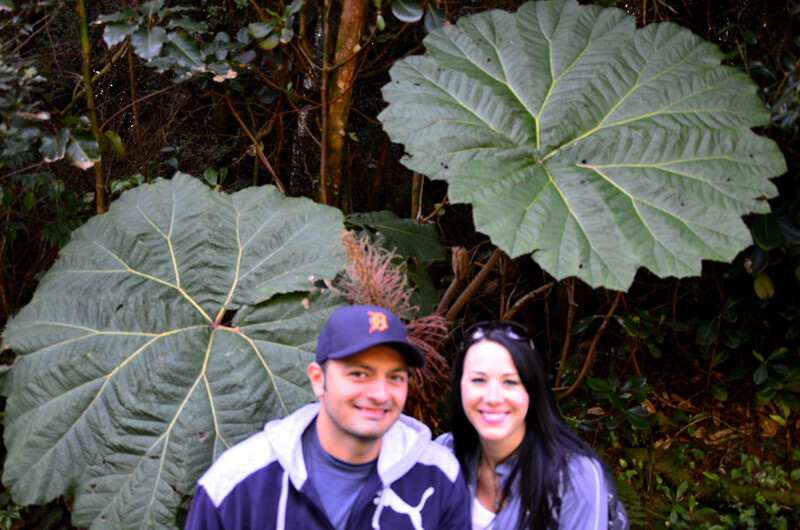 See our travels throughout Costa Rica at by clicking this link.